A family holiday to Kwazulu Natal and the Free State began with an enjoyable train trip from Cape Town to Durban. 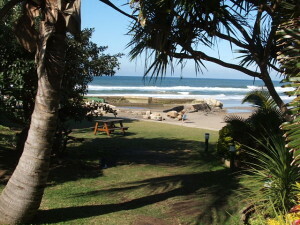 We then drove south in a hired car from Durban to San Lameer on the picturesque Kwazulu Natal south coast. Well known for its year-round tropical climate, this area is one of South Africa's most popular tourist destinations. Stations to the East across the Indian Ocean began to fade in around 1355 hours UTC on the National Panasonic car radio! Listening to strong MW signals from the Maldives, Mauritius, Mayotte, Taiwan and Vietnam while motoring along the coast was unusual to say the least! During one late afternoon around 1420 hours the following week, I heard a word perfect English announcement from the Maldives on 1449 kHz MW while driving along a crowded Durban beachfront! 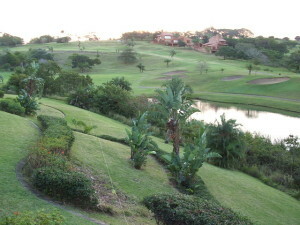 Situated just past Marina Beach, approximately an hour and a halfs drive from Durban, is the San Lameer golf estate. We spent the next two nights in this up-market tropical paridise which is surrounded by over 195 species of bird - the winged variety that is! 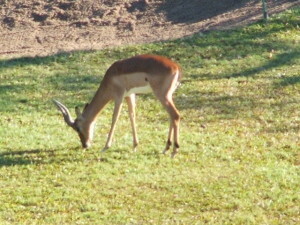 I was quite surprised to see troops of impala, reedbuck and bushbuck roaming freely around the golf course! A good opening to Australia occurred on 22/6, my first night of Dxing from San Lameer. 819 2305 MAURITIUS MBC 2 Malherbes w a relay of Sunrise radio (UK) w ads incl. 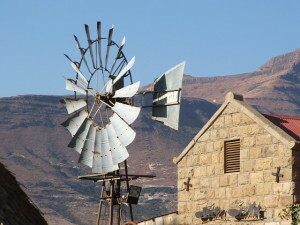 "Rubicon Estates" - good 23/6 (Presumed - The Sunrise Radio Internet Site advertises an FM radio station in Mauritius as part of its network - also heard on the car radio). 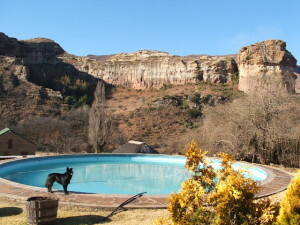 After our return to Durban, we travelled through the Kwazulu Natal Midlands to the Free State. 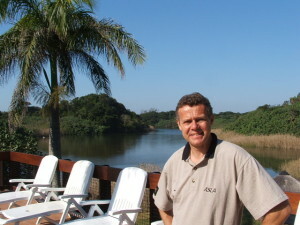 Our destination was Sunnyside, a guest farm just past the scenic Golden Gate Nature Reserve. Indiginous grassland gave way to massive, colourful sandstone formations which shine golden-yellow in the evening sun and from which the area takes its name. Dxing from the warm tropical climate in San Lameer contrasted to a rather cold, teeth-chattering evening/early morning of minus 7 degrees C in Sunnyside! Africa, and the Middle East were heard with strong signals. Although many of these stations are regularly heard throughout South Africa, the strength and clarity of the DX from this area was excellent. The highlight was the reception of Morocco on 1584 kHz. It was also a novelty to listen to the groundwave daytime signal from Lesotho on 891 kHz on the car radio. (One of the first African stations to send me a QSL way back in 74). After our return to Durban and a break from listening I decided to cure my dxing withdrawal symtoms with a late afternoon 25km drive to Umdloti Beach on the North Coast. This relatively small coastal village has sub-tropical tranquil surroundings. 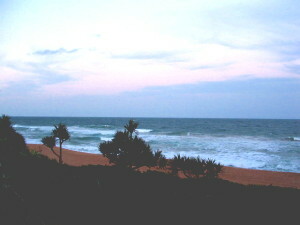 The north part of Umdloti Beach has less housing density and turned out to be a good quiet location. I directed the 80m antenna across the beach towards the Far East - a few metres from the shore break. Although the propagation from Australia was limited to 6WF on 720 khz, the strength and quality of the stations received from the Indian Ocean Islands and East Asia was remarkable. As was expected, the high altitude and internal location of the Free State suited stations from the African Continent and the Middle East while the coastal area of Kwazulu Natal also produced good signals from the Indian Ocean, East Asia and Australia. It was interesting to compare the difference of reception on certain frequencies: A good example was the reception of Angola on 1458 kHz at Sunnyside, mixing with poor/fair peaks from Mayotte. 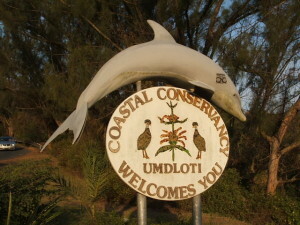 Umdloti Beach on the coast produced a strong, consistent signal from Mayotte with no sign of Angola on that frequency. Dusk MW reception on the car radio in the Free State produced the usual African/Middle East stations while reception from the Far East was best or only possible while driving along the Kwazulu Natal coast.